Malcolm founded AC/DC with his brother Angus in 1973. He was with the band until officially leaving in September 2014 although he had a brief absence to attend to his drinking issues in 1988. Malcolm sat out most of that year’s Blow Up Your Video world tour. His nephew Stevie filled in. Stevie returned for the Rock or Bust tour after Malcolm was diagnosed with dementia and was unable to continue with the band. Malcolm was originally a member of an Australian band called The Velvet Underground (not to be confused with Lou Reed’s New York band of the 60s). Prior to AC/DC their brother George Young recruited Angus and Malcolm into a one-off project called The Marcus Hook Band. Together they recorded one album before Angus and Malcolm formed AC/DC, with brother George as producer. George Young died on 22 October 2017. AC/DC’s first single with their original singer Dave Evans, ‘Can I Sit Next To You Girl’, was released on July 22, 1974. It was written by Angus and Malcolm and produced by brother George and Harry Vanda. Dave Evans lasted just one single before he was replaced with the band’s roadie Bon Scott. Scott’s first single with the band was ‘Love Song’ in 1974 but it was the b-side ‘Baby Please Don’t Go’, a cover of an album blues song, that got all of the attention. The song reached number 20 on the Australian chart and gave AC/DC their first hit. Bon gelled with the band but it was Malcolm’s driving rhythm that created the sound. ‘High Voltage’ became the first of many anthems for AC/DC. It was also their first Top 10 hit. That was followed up with the signature tune ‘It’s A Long Way To The Top (If You Want To Rock and Roll)'. The members of AC/DC were living in Melbourne at the time and took to the Swanston Street on the back of a truck to film the video for the song for 'Countdown'. A string of hits established AC/DC as one of Australia’s most popular rock acts. Those first five albums came in just two years and delivered ‘TNT’, ‘Jailbreak’, ‘Dirty Deeds Done Dirt Cheap’, ‘Dog Eat Dog’, ‘Let There Be Rock’ and ‘Whole Lotta Rosie’. While Australia got it, the rest of the world was yet to come. In 1976 AC/DC relocated to London to establish and international career. That took its toll. In 1977, bass player Mark Evans was sacked and replaced with Cliff Williams. Legend has it that Geezer Butler of Black Sabbath threatened Malcolm with a knife while they were on tour together. Williams made his album debut with the band with Powerage, arguably their greatest studio album. Then came Bon’s final album, Highway To Hell. He died February 19, 1980. Back In Back, the first album with new lead singer Brian Johnson, was released just five months after Bon’s death. It became the third biggest selling album of all-time in the USA and the AC/DC legacy was established. 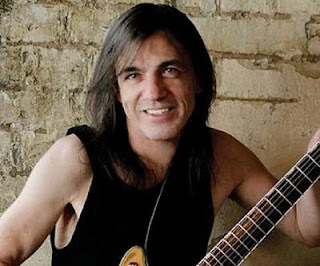 Malcolm became too ill to perform with AC/DC around April 2014 and officially left the band in September that year. He was diagnosed with dementia and was receiving full-time care in a facility in Sydney. Here is the official statement from the Young family. It is with deepest sorrow that we inform you of the death of Malcolm Young, beloved husband, father, grandfather and brother. Malcolm had been suffering from Dementia for several years and passed away peacefully on Saturday with his family by his bedside. Renowned for his musical prowess, Malcolm was a songwriter, guitarist, performer, producer and visionary who inspired many. From the outset, he knew what he wanted to achieve and, along with his younger brother, took to the world stage giving their all at every show. Nothing less would do for their fans. For those wishing to send messages to the family please visit the Sydney Morning Herald tribute site for Malcolm Young which will be available later today.